A device that will be familiar to presenters of all sorts, the teleprompter was originally conceptualised in 1948 in the USA where actor and Broadway veteran Fred Barton Jr suggested the idea to Irving Khan, the then Vice President of 20th Century Fox, of using cue cards connected in a motorized scroll. Therefore he could rely on flowing prompts without risking an on-screen blunder. This idea was then brought to the attention of Foxs electrical engineer Hubert Schlafly who quickly developed an alternative solution involving half a suitcase, a selection of belts, pulleys and a motor all set up to turn a scroll of kraft paper that showed the actors lines in half-inch letters. As the paper gradually turned, the words were read, thus marking the invention of the very first teleprompter. Since its inception there have clearly been vast design improvements meaning that the modern day teleprompter has become an easily attainable, if not essential, tool for production companies, freelancers and film studios alike. 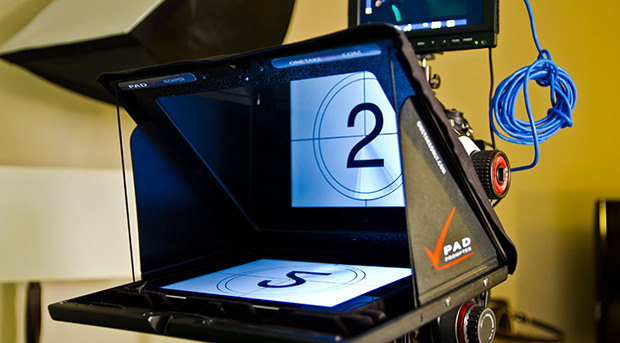 Over time, the implementation of the teleprompter has had a clear impact on the quality of video output. Valuable filming hours have been saved by cutting down on multiple takes involving script-related errors and it also enables the presenter to focus their eyes directly into the camera, which ultimately gives that professional look to a production. As we all know, hiring or buying your own teleprompter can be very expensive, running a small production company or attempting to make your own showreel means you probably dont have hundreds - or even thousands (some can cost in the region of £5000) - to spend on the type of devices used in a high end studio. Luckily, the advent of nearly everything being available in app form means that teleprompting can now be done from the comfort of your own iPad (or similar tablet) - today well take a brief look at the iPad Teleprompter. The Pad Prompter by Canadas OneTakeOnly is currently one of the best and most affordable tablet based prompters on market. Similarly sized (when folded) to a small laptop, the handmade prompter attaches either to a rail system or independently to a tripod. The design is simple and sleek, making it a breeze to attach your iPad/tablet before firing up your prompting app of choice and letting the camera roll. Another significant advantage of the Pad Prompter is that you can connect your smartphone via Bluetooth to use as a remote control - this brings the obvious benefit of changing the speed of the scroll, rewinding for second takes and changing cue sheets without having to move an inch - Ive found this feature especially handy when presenting on my own! 1. Vary volume, pitch and the flow of delivery. Making sure you speak slower and clearer than you would usually. It may well sound silly or unnatural during the shoot, but youll be pleasantly surprised by the end results! 2. Know your material. Whether you are presenting information, interviewing or even being interviewed, preparation even when using a teleprompter is the key to a natural and flowing style. 3. Avoid shifty eyes. It is important to maintain steady eye contact as this portrays you as credible and trustworthy. TV cameras can zoom in on your features, so shifty eye movement or unsteadiness will be evident. 4. Dress. Your dress style should be appropriate for the content you are presenting on, its often the first thing a viewer will notice. Excess jewellery and strong patterns such as zig zags or polka dots can draw the viewer's attention away from what it is you're actually presenting about.